Participants in the Africa Endeavor 2011 planning conference listen to an exercise overview in Bamako, Mali, Jan. 24, 2011. U.S. Africa Command concluded the main planning conference for Africa Endeavor 2011 in Bamako, Mali, Jan. 27, after four days of deliberation and exercise planning sessions. Africa Endeavor is an annual, multinational communications exercise that focuses on interoperability and information sharing among participating nations. "The goal of Africa Endeavor is to improve the communications, command, control and information capabilities of African militaries so as to strengthen African stand-by forces," said Maj. Gen. Gabriel Poudiougou, Chief of Staff of the Malian armed forces at the opening ceremony. "In short, a country’s security is reinforced by open communications with its neighbors," said Ambassador Gillian Milovanovic, U.S. Ambassador to the Republic of Mali at the ceremony. "The Africa Endeavor exercise aims to improve communication and to strengthen relationships among countries in the region and across the continent in order to improve everyone’s security." To this end, the planning conference brought together more than 180 participants from 41 African, European and North American nations, as well as observers from Economic Community of West African States (ECOWAS), Economic Community of Central African States (ECCAS), the Eastern African Standby Force and NATO to plan interoperability testing of communications and information systems of participating nations. 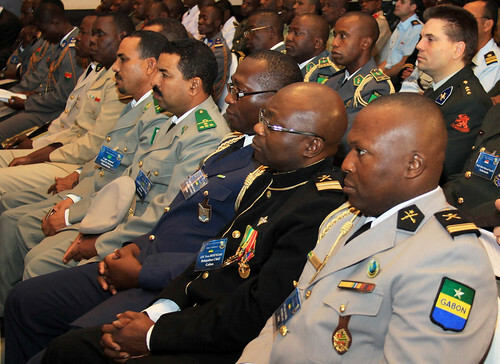 "This conference had the largest number of participating countries to date in the Africa Endeavor series," said Brig. Gen. Robert Ferrell, director of U.S. Africa Command’s Command, Control, Communications and Computers Systems Directorate during the closing ceremony. "This is a significant indicator that the word is getting out on the great work done during Africa Endeavor," Ferrell said. But true interoperability is more than just compatible communications systems; it’s also developing a cadre of professionals who know how to communicate with each other. "The best part of these events is the opportunity to interact with people from dozens of different countries," said Malian Army Lt. Col. Moussa Traore, Malian liaison for the exercise. "I’m from western Africa, but now I have family in the east and in the south and in the center. These people who I have met and have learned to know through Africa Endeavor have become members of my extended family." The weeklong event included the review of exercise goals and objectives, the development of exercise scenarios, deliberations to determine the roles of the different countries in the exercise, the regional network architecture and a list of required equipment, a visit to the exercise site and initial discussions to determine the site of next year’s exercise. "We have made significant progress on standardizing communications tactics, techniques and procedures that will be tested and refined during the final planning conference and executed during the main exercise," said Ferrell. The final planning conference will be held in the Gambia in April, and Africa Endeavor 11 participants will return to Bamako in June for the main exercise. "The impact of improved cooperation and coordination is evident far beyond military engagements," said Ambassador Milovanovic. "When a natural disaster strikes, for example, affected populations benefit from our cooperation and fewer citizens might perish or be injured as a result. Disasters and do not stop and national borders. Our communications efforts must therefore follow the same model if we are to be effective." Can somebody help me with a diet and exercise plan? Question by Nicole Dillard: Can somebody help me with a diet and exercise plan? I am currently 280 lbs and I’m 5’6.. Can anybody recommend a good diet/exercise plan? My goal is to be around 150 as soon and as healthy as I can. Please no negative or rude comments. Thanks.